The singer and bandmate Jordan 'Rizzle' Stephens will be performing Heart Skips A Beat with Olly Murs, which is up for best British single. "I'd love to meet Coldplay - meeting Chris Martin would be wicked. And Damon Albarn because I love him. He is a genius and our ultimate idol," Harley said. The musician - who stars in a short film for the new PlayStation Vita console with Jordan - tips Ed Sheeran, who leads with four nominations, and Adele to be the big winners on the night. "Ed Sheeran should scoop a few, and Adele. And hopefully Jessie J too," he said. The 20-year-old admitted he hadn't heard about planned tributes to Whitney Houston and Amy Winehouse, but said: "Amy Winehouse was definitely an inspiration to us, 100 per cent. Her albums are incredible, and she's got one of the best voices I've ever heard. "She is one of the people I always wanted to meet, but never got the chance to. Whitney is an absolute legend - I personally didn't have much of a musical connection with her, but she is a legend." 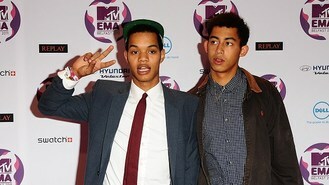 Rizzle Kicks' short film for the launch of PlayStation Vita can be seen on www.youtube.com/psvita.